There's a new €2 coin entering circulation today to commemorate the 100th anniversary of The 1916 Rising. Ireland had never issued a personalised, commemorative coin before but today 4.5 million of them will begin to enter circulation. 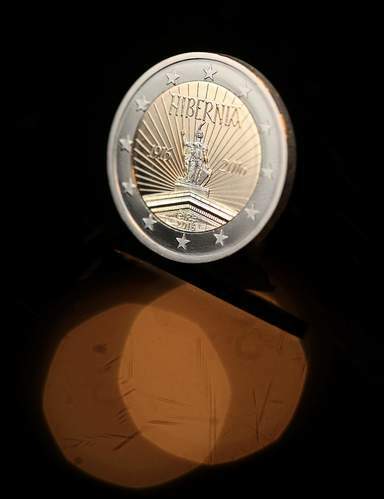 The coin features the years 1916 and 2016, the Hibernia statue from the roof of the GPO (one of the locations used by volunteers during the rising) and the word 'Hibernia' in Book of Kells style lettering. The design is a result of an international competition in which participants were asked to submit designs based on the Proclamation of the Irish Republic, the document read aloud by Pádraig Pearse outside the GPO on 24th April 1916 which marked the beginning of the rising. We think it looks great and there are various collectors editions of the coin available via the Central Bank as of today.